It’s not every day you get to meet an idol. 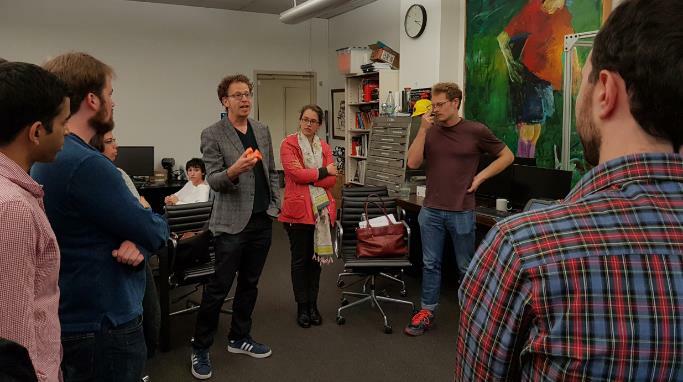 I couldn’t believe my luck when during a field seminar I took at UC Berkeley last month, I had the privilege to meet some of the brilliant minds of Berkley. Water 1.0 – Building complex pipes systems and channels to bring water and carry away sewage to/ from growing cities. Water 2.0 – Treating drinking water, usually with filtration and/or chlorine. Clean drinking water is man’s greatest public health achievement. Water 3.0 – Development of vast infrastructure of sewage treatment plants. Water 4.0 – Creation of innovative technologies to deal with water shortages. 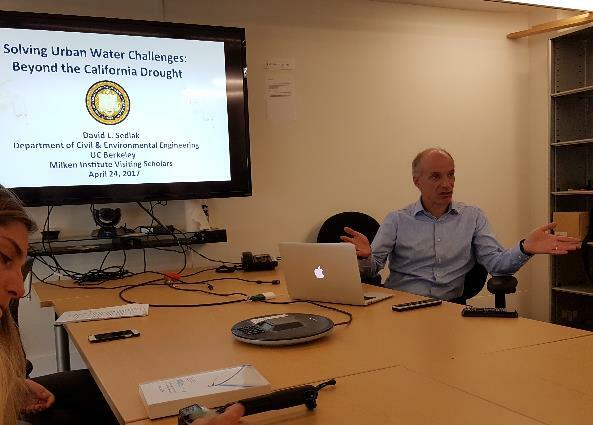 Professor Sedlak presented the different challenges California is facing over the past few years, how different and similar they are from Israel’s challenges, some lessons learned from Israel’s water initiatives and the major drivers for choosing how to address these challenges in California. Next, we visited the AUTOLAB Robotics Lab in Etcheverry Hall where we met Professor Ken Goldberg, Professor and Chair of the Industrial Engineering and Operations Research Department, and part of his team: Roy Fox (an Israeli postdoc), Sanjay Krishnan, Michael Laskey and Jeff Mahler. We had a chance to see a live demo of some of the robots in action and we had the opportunity to try and interact with some. Professor Goldberg shared with us their work, their main Cloud Robotics research involving sharing information between robots over the cloud, and he also explained some of the challenges they’re trying to deal with, like: having the da-Vinci surgical robot make the surgery process easier by compensating for the patient’s breathing, making the ABB robot adept at analyzing and grabbing almost any physical object. Before leaving, Professor Goldberg expressed his close connection and affection to Israel and the Jewish religion and he told us about a short essay he wrote about twin paradoxes, from rabbis and robots, that may have something to teach us about human learning. Later that day, Professor David Zilberman, Chair of the Department of Agricultural and Resource Economics at U.C. Berkeley, gave us a walking tour through the campus. He shared with us the history of the buildings and famous and notable people that contributed to the university. 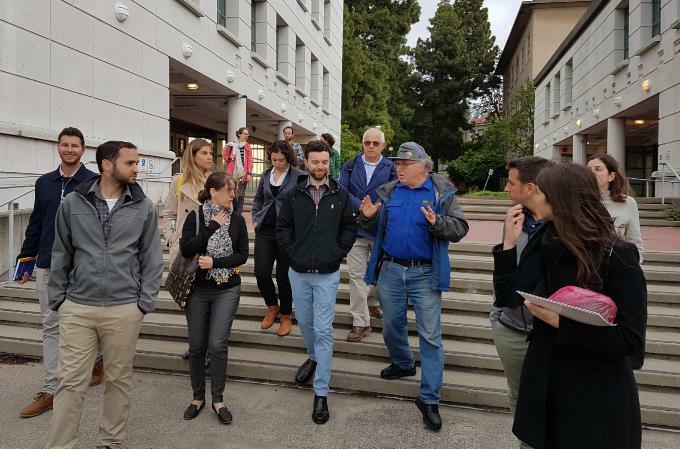 When we reached the Energy Bioscience Institute, we had a chance to hear from Professor Zilberman about his work, the BEAHRS Environmental Leadership Program (EDP) and the Master of Development Practice (MDP). Professor Zilberman told us all about the past, present and future of the bio economy and bio fuels and he described how one can transition from an idea to an effective supply chain. He expressed his strong belief in biology, that plants have much bigger potential than oil, the future of climate manipulation and using bacteria in computing. Meeting these magnificent people and hearing what is on their mind was inspiring and mind-blowing! It was heartwarming to see how Israel is in the hearts and minds of these people. I also found it amazing to see how Israel, such a tiny country in the Middle East, affects so many lives in so many ways in the United States and in the state of California in particular.